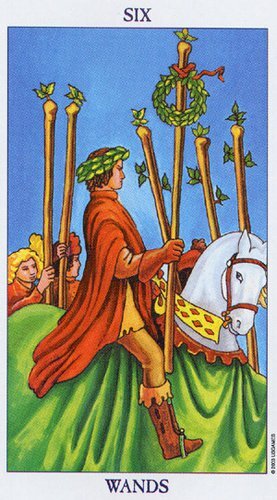 Six of Wands is a card of victory. 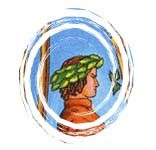 Having overcome the difficulties and struggles of the preceding card this card assures us of triumph over adversity. Now is the time to take stock of the present. See that the here-and-now is informed by the past and connected to the future. gently reminded that we are ultimately responsible for how others perceive and treat us. Thus, victory over self AND power within is the reward of this horseman as he triumphantly sits upon his horse. Horses lead heroes into and out of the realms of darkness. They know the way and they know the dangers along the way. In this card the horse is white. A being whose colour is the colour of purity, beauty and dignity - qualities that he transmits to his rider. This horse carries his rider from the past into the present and towards the future in the world of human experiences. Because the intent of this card is to picture victory the horse is white to symbolise nobility, triumph, and the mildness of perfect surrender to the rider’s will. The horse in this card is the horse of mid-day, a creature of the sun. In the light of day the rider has clarity of vision and steers the horse according to his will to meet the future. e element associated with action. 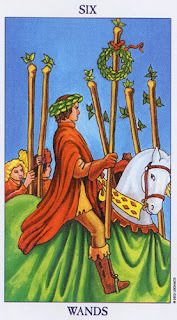 Thus, the 6 of wands speaks of the actions needed to achieve victory. This victory is not achieved through passive thought, it is achieved through action, direction and determination. It transforms us, forever changing us as we burn with desire to achieve victory. When facing the flames of change we do not retreat, we persist and we surrender to the transformation that we must undergo in order to experience a brief moment of victory in self-mastery before we continue onward in further pursuit of our soul’s journey. Self Mastery, this is what we strive for and this is what the horseman in the 6 of Wands has experienced a taste of. But, as we all know, self-mastery like enlightenment is elusive. It is a continuous journey of insights and victories, changes and transformations, and like the wind cannot be held onto and claimed as owned once experienced. The victory of self-mastery is aimed for throughout, and is the ultimate goal of the soul’s journey as it experiences all there is to experience. In contemplating how this card can inform and remind us of our own pursuits towards victory, we ask ourselves today what it is that we wish to gain self-mastery over? What are the impulses in need of discipline that are dictating our future experiences? What little choices do we make each day that determines our destinies? Do we need to review these choices in order to set ourselves on a path towards victory? What do we need to change in our daily lives? What is it that we need to action? And, are we procrastinating when we should be taking action?